I have a sister who is one of a kind. She is an inspiration to all of us her siblings, especially to me. Though born without a right arm, she never let her disability affect her ambition in life; in fact she considered it a challenge. As a child she had wanted to serve God as a missionary. When she was six, Grandma brought her to a pino teacher, but the teacher would not accept her because of her physical condition. The second teacher did the same. Grandmother, however, talked the third teacher into accepting my sister. so she began her piano lessons. 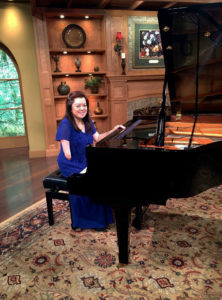 during her first practice she noticed the tip of her disabled arm hurt when she pressed a key. But she ignored it, because she didn’t want to ruin her ambition. by 1992 she started giving recitals, and in 1996 she went to US for her first concert outside the country. It was the beginning of her successful career as a pianist; it signaled the start of her music ministry- her way of drawing people to god and inspiring them to give themselves fir His service. More concert tour abroad followed after she finished BS Psychology from the University of St. La Salle in Bacolod City. Coming home to the Philippines, she applied and was accepted at 1000 Missionary Movement in Tagaytay City. Assigned in the promotion section, she went to places to promote the Movement’s work through her music. the she was assigned in South Korea, where she continued doing her missionary endeavors. as of this writing, she is in America holding concerts and challenging people to have a deeper relationship with God. Having ambitions in life is not a problem if one will strive hard to achieve them. My sister worked hard to fulfill her dream. she was proven that even a disabled person can work hard and make her dream come true. In her concerts she usually challenges the audience; ‘ If I can do it with on hand, you can do it for you have no disabilities”. Indeed, there e is nothing impossible if you believe in God. I’m glad I have Mary Grace Gellangcanao as my sister.